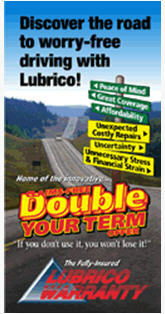 Lubrico Warranty has been providing mechanical breakdown protection to hundreds of thousands of car buyers since 1977. For more than 38 years, they have been dedicated to providing a high level of customer satisfaction through reliability, service and continuous product development, which has made them the leading used vehicle warranty provider in Canada! Across Canada, over 4,000 car dealers choose Lubrico Warranty as their extended warranty provider. We trust Lubrico and they provide more than 2,500 repair centres to protect customers from unforeseen repair expenses. Through excellent customer service, fast claims processing and prompt claims payment, they have built a solid reputation in this industry.